Checkerboard City: Can Indy Rock? If I had to sum up Indianapolis in one word, it would be “Underrated.” With a population of 829,718, the Hoosier State capital is the second-largest Midwest city. But despite its size it’s known as “Naptown” and “India-No-Place” due to its reputation as a bland, suburban-style metropolis with few attractions besides the Colts, the Pacers and the Indy 500. I’m told that in the 1980s you couldn’t even buy a sandwich downtown after 6pm and the massive streets, lined with dozens of garages and oceans of parking lots, were so deserted you could safely walk down the middle of them. But last weekend when I took Megbus there to meet up with my buddy Jake, in town for a conference, I discovered a surprisingly hip city with some fascinating architectural features and plenty of fun stuff to do. And while there’s little public transportation to speak of, and the city’s dominant image is a racecar, I was shocked to find a level of bike-friendliness that gives Chicago a run for its money. Friends who grew up in Indy warned me the town was a cultural wasteland, but things seem to have changed in recent years, especially after last winter’s highly successful Super Bowl—I had a blast. In Broad Ripple, a dense, walkable neighborhood north of downtown, I strolled between brewpubs and heard a terrific set by the Jesus and Mary Chain at the Vogue, a Metro-like rock venue. Near Massachusetts Avenue, often compared to Wicker Park’s Milwaukee Avenue, I feasted on schnitzel at the Rathskeller, a huge, atmospheric German restaurant in a building designed by native son Kurt Vonnegut’s grandfather. Other highlights included the Oranje festival, an art-and-music extravaganza on the Indiana State Fairgrounds, and a textbook pastrami-on-rye at Shapiro’s Deli, in business since 1905. 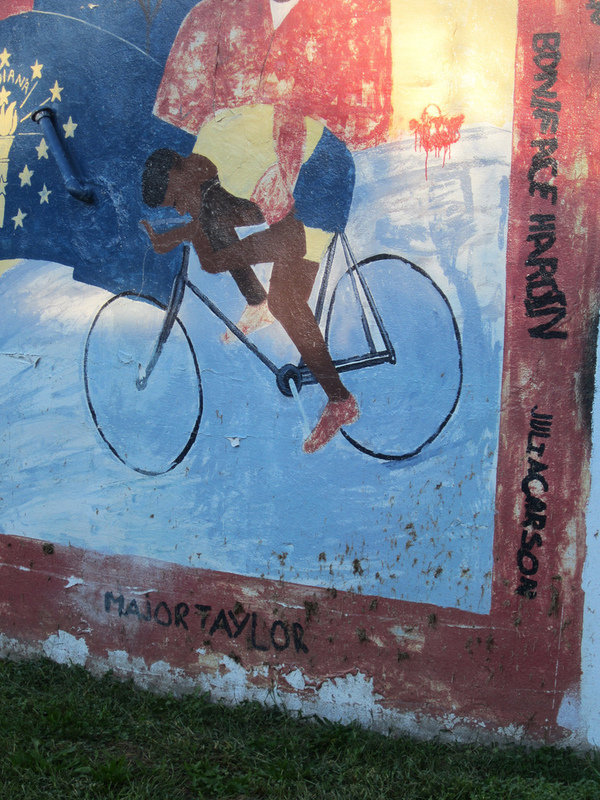 There’s lots more stuff I want to see on my next visit, especially the Marshall “Major” Taylor Velodrome, named for the barrier-breaking African-American bike racer who grew up there. Since transit options are limited to the under-funded, anemic IndyGo bus system, I spent much of my trip pedaling my folding bicycle along the Monon Trail, an award-winning rails-to-trails that runs 16.7-miles from downtown to the north suburbs, where we were staying. When traveling with Jake and other bike-less companions, I dissembled my cycle and threw it in the trunk of a cab. On Saturday, over biscuits and gravy in Chatham Arch, I got the skinny on local issues from my fellow planning geeks Kevin Kastner and Eric McAfee, part of the eleven-person collective behind the blog UrbanIndy.com. I ask about the challenges Indianapolis faces in becoming a first-class transportation town. “Not having good transit and a lack of political will from the state to improve it,” responds Kastner. For example, he says, the Indy Connect proposal would have created more extensive bus service, bus rapid transit and a light rail line to the northern ‘burbs, but due to apathy from lawmakers it never even got put to a vote. The Indy Bike Hub YMCA, a commuter station with indoor parking, repairs, showers and a gym, recently opened downtown. 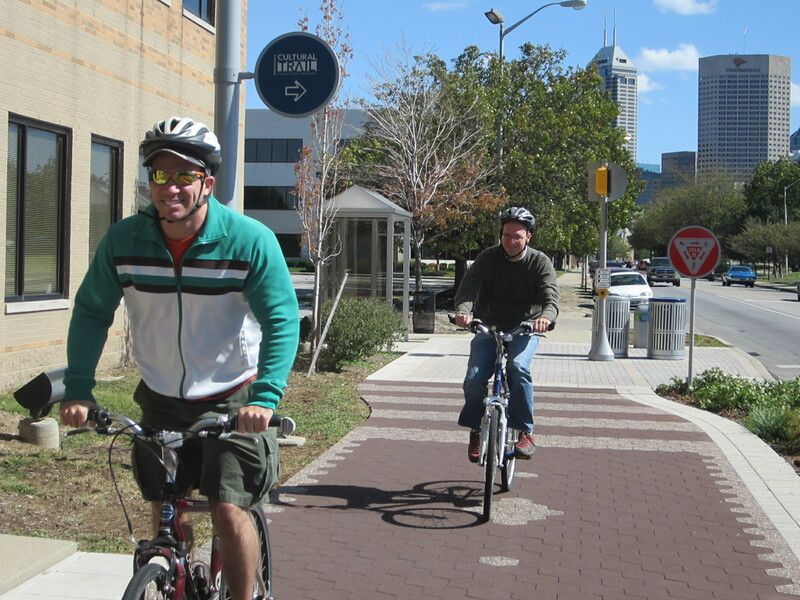 And most exciting, the city has almost finished building the Indianapolis Cultural Trail, nearly eight miles of Copenhagen-style separated bike-and-pedestrian paths connecting five designated cultural districts, as well as many museums and memorials. 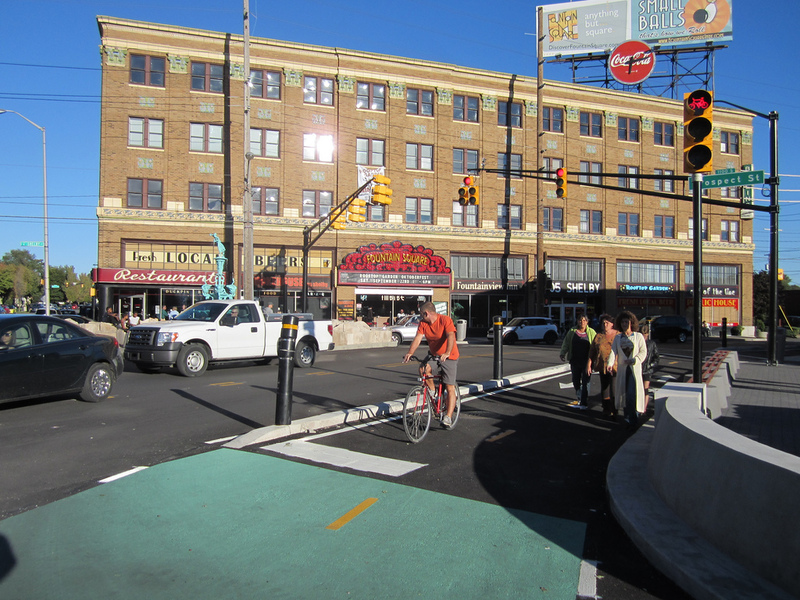 Unlike Chicago’s new protected bike lanes, which so far exist in short segments, the cultural trail is a seamless network, with wide, brightly colored street crossings to warn drivers of bike traffic coming off the sidewalk. “The trail attracts a demographic that’s terrified of urban cycling and puts them in an environment where they feel comfortable,” McAfee explains. After I swig my coffee, the guys take me on a tour of the trail and, as promised it’s a relaxing, worry-free experience. We pedal to the Indiana War Memorial, an imposing limestone structure inspired by an ancient Greek mausoleum, set on a picturesque plaza reminiscent of D.C.’s National Mall. We cruise by the state park, similar to Chicago’s Museum Campus, created by rerouting Indy’s Washington Street and converting the old bridge into a footpath. And, of course, we visit the iconic Soldiers’ and Sailors’ Monument, a 284-foot-tall pillar topped by a victory goddess, located on the circular drive at the epicenter of town. We end our ride in the Fountain Square district, where artists and young professionals rub elbows with the longtime residents, blue-collar folks who migrated from the Appalachians. Nowadays the neighborhood has galleries, clubs and a record store, as well as classic greasy spoons. The area’s centerpiece is the vintage Fountain Square Theatre Building, featuring a retro diner, a boutique hotel and two duckpin bowling alleys. On the fifth-floor rooftop bar we kick back with hot pretzels and pints of Oktoberfest beer from Sun King, one of a growing number of local breweries. Gazing at the modest skyline, I bring up the article “Why I Don’t Live in Indianapolis” posted on Urbanophile.com by planning expert Aaron Renn. A former Indy resident and recent Chicagoan, Renn has great fondness for the Circle City but rails against what he calls the town’s acceptance of mediocrity and lack of support for design excellence. The result, he writes, is ugly new developments and faceless garages built on prime downtown real estate. He cites the Cultural Trail as being an exception that proves the rule. Dozens of locals wrote back to defend their hometown. “People argued this is an easy place to get things done,” explains McAfee. “And, especially after the Super Bowl, there’s a spirit that our best times are ahead of us.” Suddenly a hullabaloo in the street below draws us to the rooftop’s railing to watch a raucous art parade go by, and I get the sense these Hoosiers are right to be hopeful. Chicago Critical Mass 15th Anniversary Ride Join hundreds of cyclists in this monthly parade and demonstration for bike-friendly streets, a leisurely pedal to a destination yet-to-be-determined. To mark the anniversary, Massers will be handing out free t-shirts, and there should be some surprises. Friday, September 28, Daley Plaza, 50 West Washington, chicagocriticalmass.org, 5:30pm; free. Bicycles & the Arts Festival This happening includes Skype conversations with advocates and artists across the country, a performance by the Chicago Bike Band and a reading from the bicycles-and-beer book “Bars Across America” by Newcity’s John Greenfield, and more. Friday, September 28, International Art Group Gallery, 4161 North Damen, (312)380-9223, chicagocalling.org, 8-10pm; $5. The Perimeter Ride This annual bike tour of historic landmarks and goofy commercial architecture roughly follows the city borders, for a total of about 100 miles. Since you’re never far from a CTA or Metra bailout, it’s a great first “century” ride for newbies. Saturday, September 29, Buckingham Fountain, Columbus Drive and Congress Boulevard, (773)865-7445, tinyurl.com/chicagocentury, 8am; free. Evanston Green Living Festival This environmental expo features free pedicab rides, test drives of new electric vehicles, secure bike parking and much more. This year’s theme is “Water: Preserving and Protecting It!” Saturday, September 29, Evanston Ecology Center, 2024 McCormick Boulevard, Evanston, (847)448-8256, evanstongreenfest.org, 9am-3pm; free.